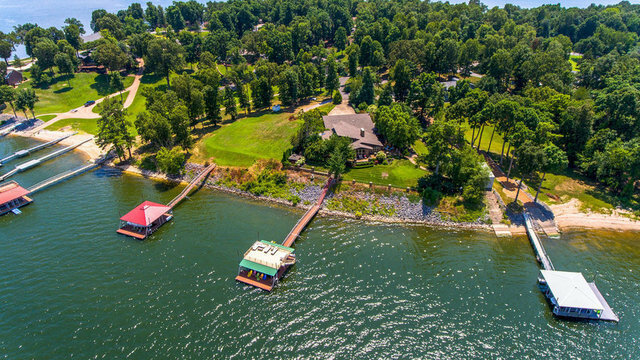 Paradise awaits you at this Kentucky Lake home. Home boast expansive views of Kentucky Lake and positioned just across from the Kentucky Dam. Originally constructed in 1940, this cedar and stone home has been professionally expanded and updated over the decades. Upon entering home you are greeted with vaulted ceilings, impressive exposed beams and a direct view of the water ahead. The open floor plan flows from foyer into kitchen and living room. With multiple doors leading to patio, this home is ideal for entertaining. Each bedroom offers private patio access. The master bedroom is truly a suite offering 25’ of floor to ceiling windows with uninterrupted views of the lake, wood burning fireplace and master bath with large walk in shower and soaking tub. The outdoor living areas have been designed to capture and enjoy the beauty of the lake from sunrise to sunset. Side patio with built in fire pit over looks the croquet and badminton yard which is lined with landscaped levels of flower beds including mature Peonies and blooming Crape Myrtle trees. Just past the croquet yard lies a garden bed positioned to receive abundant sunshine and host a satisfying garden all summer long. Fastidiously groomed, hardwood-shaded paths and patio wrap around the property and lead to dock. Custom two story dock offers two boat slips, jet ski slips and large sun deck. Not only does this property offer a prized view of the Kentucky Dam, an additional desirable and rare feature property offers is year round water and private boat house. Don’t miss this opportunity to become part of the rich history of this home. Contact listing agent to arrange a private showing.